The charming and charismatic and hotshot head honcho of JPMorgan Chase, Jamie Dimon, is currently visiting Tokyo to thank his Japan-based employees for sticking it out in the earthquake-ravaged country. 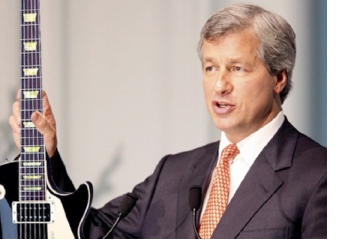 Dimon plans to stay in the country for less than 24 hours, and already his presence has caused quite a stir. During his visit, Dimon has been leading silent prayers as well as standing alongside admirer after admirer as cameras flash like gunfire. That is, as one person told The Wall Street Journal, so many people want their pictures taken with Dimon that it's almost like he's "a Japanese pop idol." Although other big banks headquartered in the US have sent top execs to Japan to encourage and support their Far Eastern troops who've been working despite the tragedy, only JPMorgan has sent their chief executive. Though, in Goldman Sachs' defense, its pop idol had a pretty big gig yesterday morning in New York, down at a federal courthouse in Lower Manhattan.